Loyal Monsanto Legacy farmers with concerns about how focussed the future Bayer will be on agriculture, can rest assured that agriculture (Crop Science and Animal Health) are now the largest of the three divisions in Bayer. Madrazo continued by saying that the combined company’s extended footprint and product range, stand to benefit farmers from all over the world. Their knowledge of global markets and recognition that a tailored approach for each market and customer segment is required will drive Bayer to find specific solutions through innovation, sustainability and digital transformation. During his recent visit to South Africa, Madrazo shared his ‘accidental’ agricultural journey, ‘Like most good things in life it was never planned. After obtaining my legal degree, I applied for an advertised position at Monsanto in 1999. I applied on-line, something that was totally unheard of in those days. They liked what they saw and appointed me as Legal Director for Latin America North. Through the years I moved away from the legal side towards the business side and served Monsanto for the past 19 years.’ He held the position of Vice President and Monsanto´s Commercial and Global Supply Chain Lead prior to the Bayer/Monsanto acquisition. 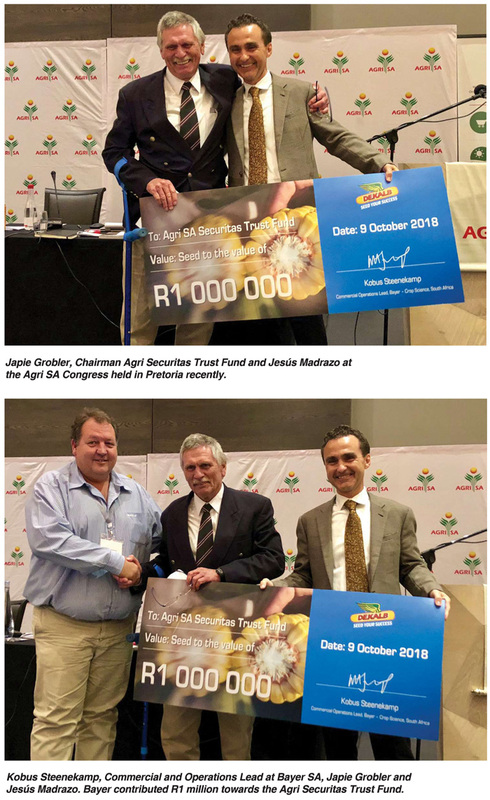 Madrazo had the opportunity to be a speaker at Agri SA’s recent congress and shared his vision for the future of farming with agricultural industry leaders and farmers present. He assured the audience of Bayer’s commitment to an increased focus on innovation and digital transformation for the benefit all farmers and emphasised how important sustainability is for the company. Article submitted by Hanlie du Plessis, Media Consultant. For more information, send an email to hanlieduplessis@telkomsa.net.